Sometimes a flavor can spark a memory, or a flood of memories. In the case of these hand pies, the memories revolve around a grandmother, Tilly Alhadeff, and her talent for Sephardic Jewish home cooking. I met Greg, the blogger behind Sippity Sup, at a local food blogger’s meeting two years ago. We’ve been friends ever since. I was thrilled when he announced that he was working on a new cookbook about pies– the savory kind, not sweet. He spent several months writing, testing, and photographing various pie recipes. I became accustomed to seeing pictures of pie in my Facebook news feed, as he experimented with numerous variations on the savory pie theme. At one point, I even helped him test a recipe for the cookbook… this one, in fact! Fast forward several months later, and the book is now available for purchase. 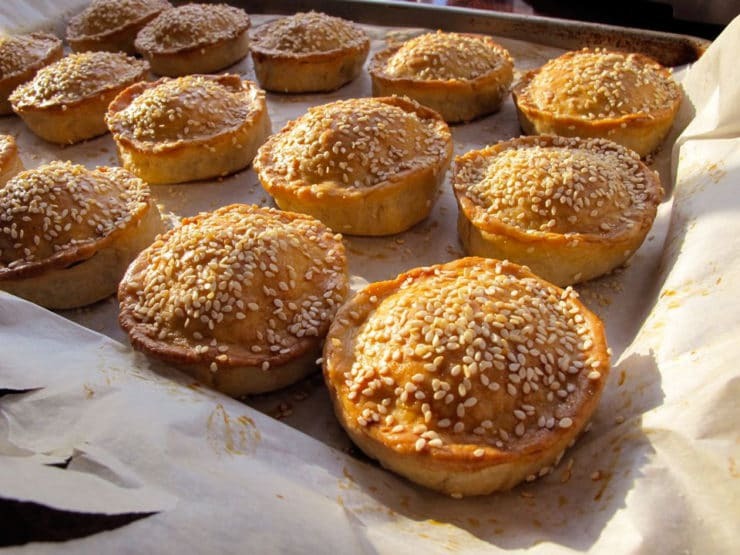 Savory Pies includes a diverse collection of pie recipes from around the world. It’s not a kosher cookbook, so those of you who keep kosher will not be able to use several of the recipes here. For the rest of you, you’ll enjoy recipes for seasoned meats, vegetables and cheese baked inside perfectly flaky pie crusts. And for those who do keep kosher, there is a Sephardic gem inside this book that Greg was kind enough to share with me– Tilly’s Pastelles. Tilly was my partner Ken’s grandma. She made these pastelles her whole life– so many times and so well that there was no need for a recipe. But once she passed, Ken was afraid his grandma’s particular version of this Sephardic classic would be gone as well. I know it could never be quite the same, but I’ve done my best to reproduce her recipe, based on his loving memories of his grandma and her meat pies. Her full name was Matilda Alhadeff. She and my grandpa Albert came to Seattle from Rhodes, Greece as teens. Family lore has it that Tilly came over on a banana boat, hence her life-long dislike of bananas. 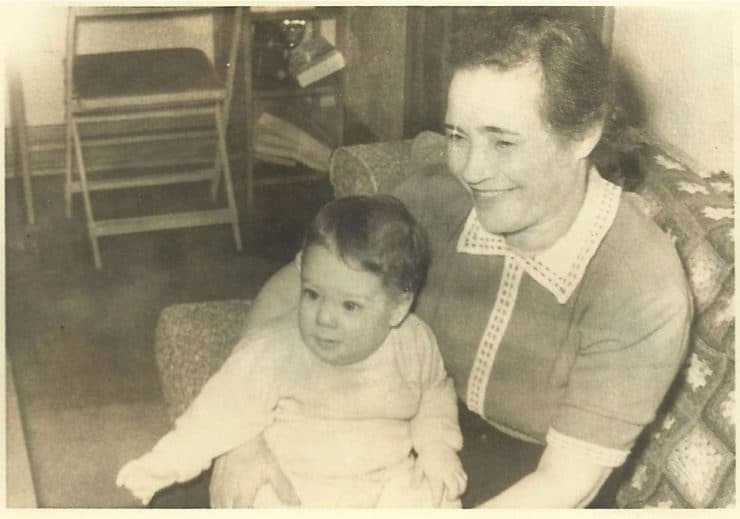 She and grandpa were traditional, observant kosher Jews in a tight-knit Sephardic community. Reading Ken’s memories warmed my heart. I have similar memories of my own grandparents and they foods they used to cook. Many of us do. Recipes like this one help to remind us of the good times we shared. Making this recipe felt like a celebration of Tilly’s spirit. Do you have a family recipe that sparks memories for you? 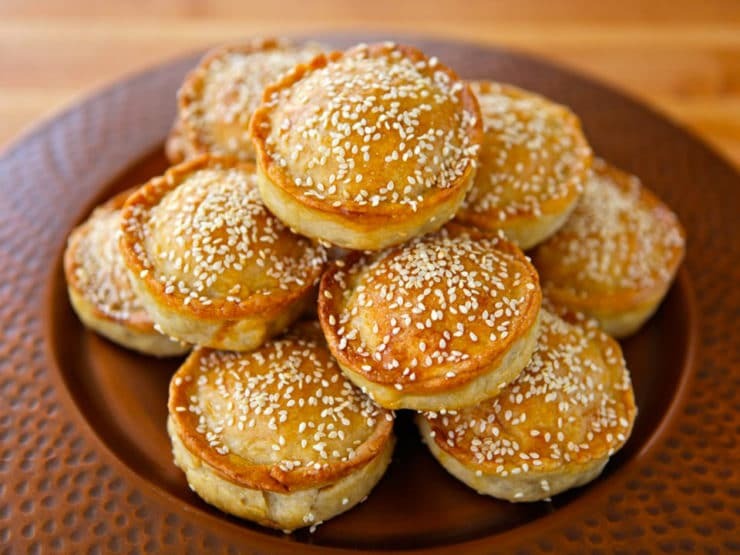 A Sephardic recipe from Greg Henry's cookbook, Savory Pies - Meat hand pies with egg, parsley, and herbs sprinkled with sesame seeds. Kosher. In a large saucepan, bring 2 1⁄2 cups water, 1 cup vegetable oil, and 1 teaspoon salt to a boil. 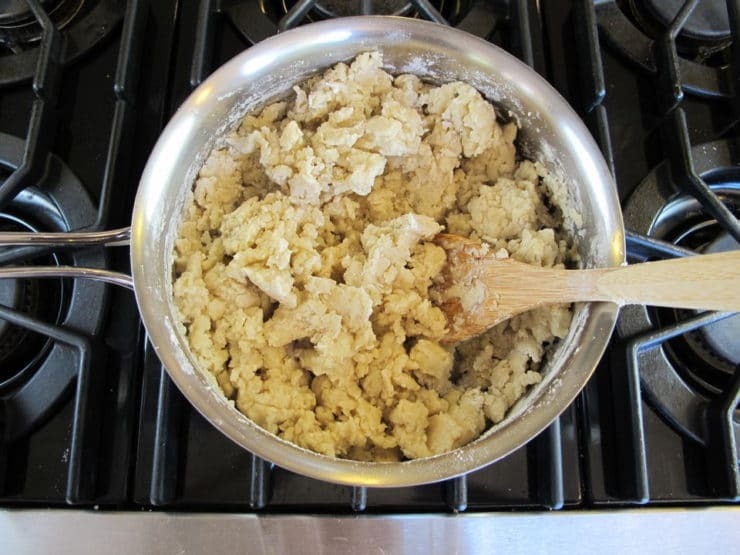 Remove from heat and quickly stir in 6 cups flour, using a wooden spoon, until a soft dough forms. Scrape onto a lightly floured surface and knead, using more flour if necessary, until smooth, pliable, and not too sticky. Form into 24 balls about 2 inches in diameter (about 1 1⁄2 ounces each) and 24 balls about 1 1⁄2 inches in diameter (about 3⁄4 ounce each). Place on parchment-lined baking sheets, cover with plastic wrap, and set aside at room temperature. Heat the remaining 1 tablespoon oil in a large sauté pan over medium-high heat. Add the onion and cook until softened, stirring often, about 5 minutes. 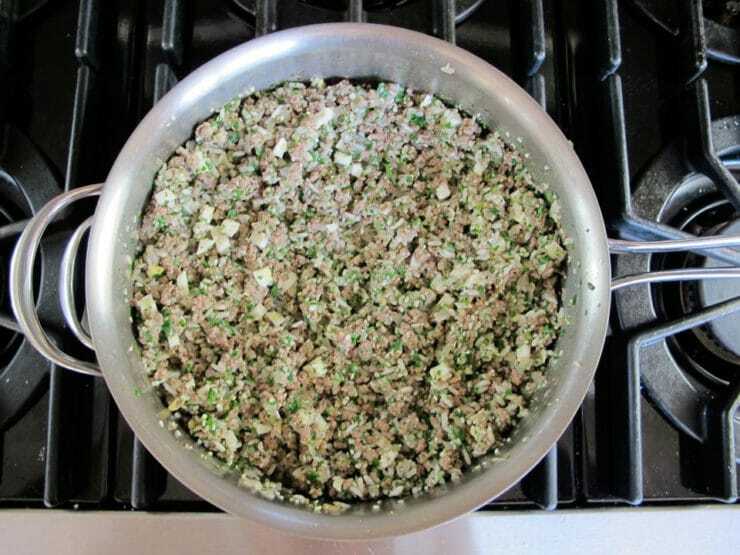 Add the ground meat, 1⁄2 teaspoon salt, oregano, mint, if using, cumin, and paprika. The dried mint is optional. Cook, breaking up the meat with a wooden spoon, until well browned, 10 to 12 minutes. Reduce to very low heat and stir in the remaining 1⁄2 cup water and uncooked rice. Cover to cook the rice al dente, about 12 minutes. Uncover, remove from the heat, and stir in the hard-cooked egg, parsley, 1⁄4 cup sesame seeds, and black pepper. Taste the filling; add additional salt, pepper and seasonings to taste, if desired (see my notes below). Set aside to cool completely. Place oven racks in the upper and center positions. Preheat the oven to 400°F. 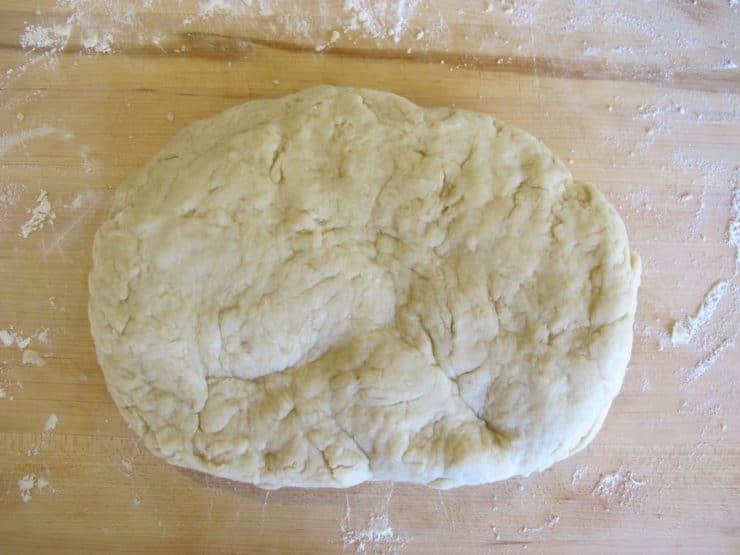 Using your floured hands, shape the larger dough balls into cups 2 1⁄2 to 3 inches wide and almost 1 inch deep. 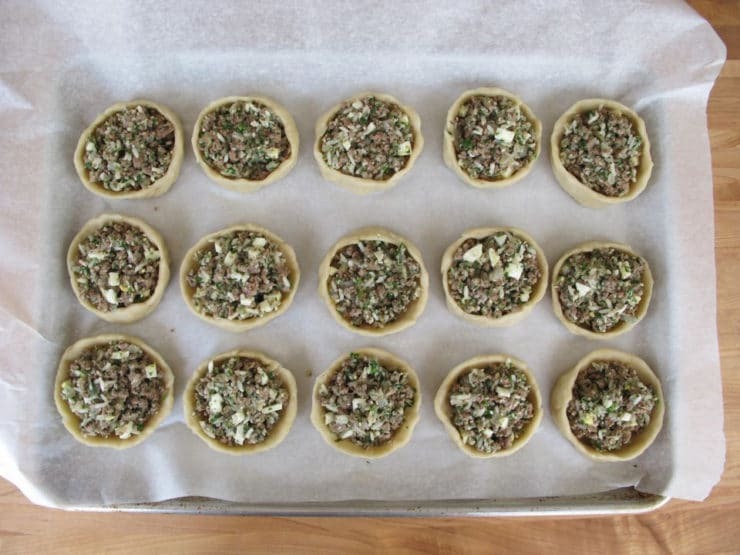 Return them to the prepared baking sheets as you work, about 1-inch apart. 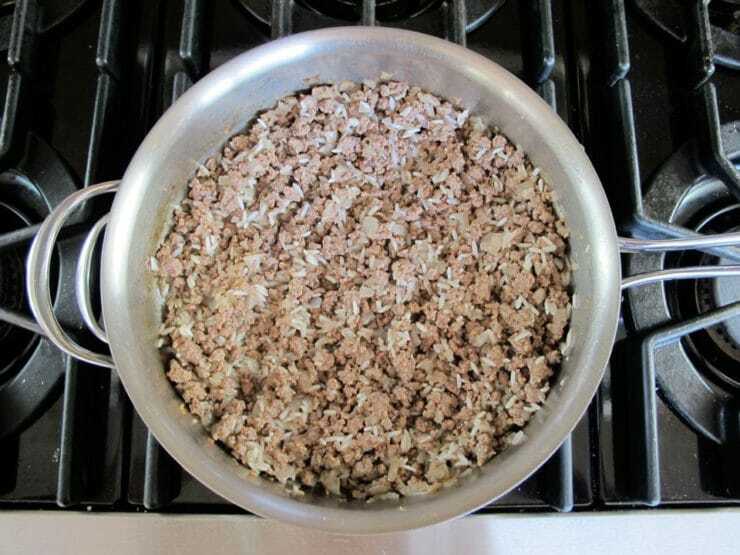 Divide the meat mixture evenly between the cups, mounding it slightly. 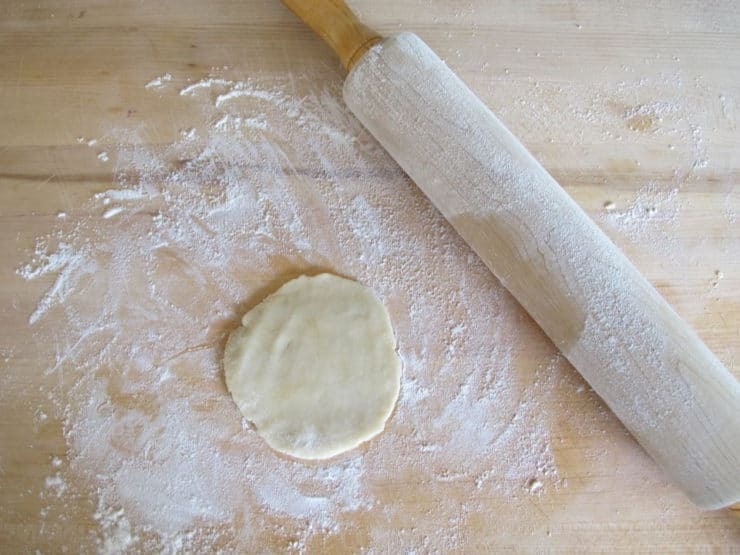 On a lightly floured surface, use a lightly floured rolling pin or floured hands to roll or press the 1 1⁄2-inch dough balls into 3-inch rounds. 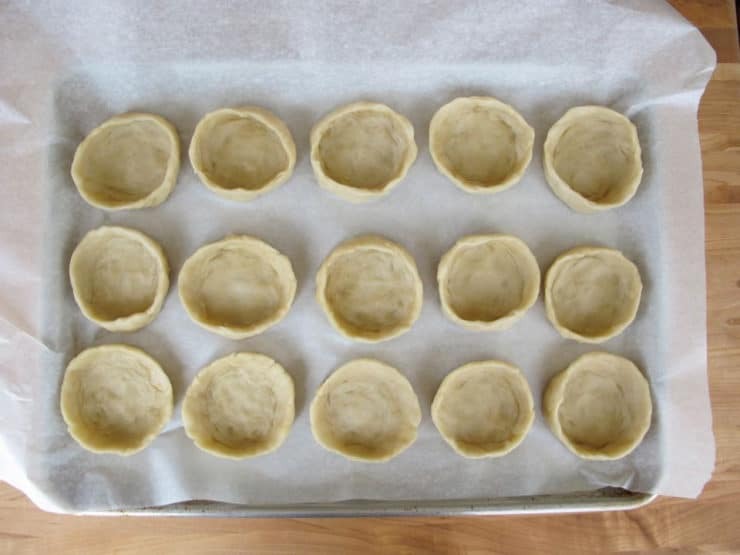 Cover each filled pastelle cup with a dough round, pinching the edges together in an upward motion to make a raised lip. Brush the tops and sides with egg wash. Sprinkle the tops with salt and sesame seeds. Bake until the pastelles are golden brown, 35 to 40 minutes; switch the sheets halfway through. Serve warm or at room temperature. This recipe is easily halved to make just a dozen pastelles. 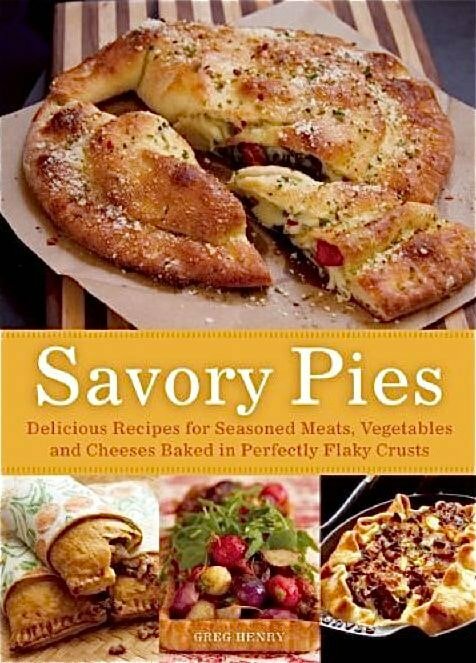 To purchase a copy of Savory Pies, click here. My grandmother, Perla Galante [nee Alhadef], came to Seattle from Rodos. I still remember her pastelicos, which I loved. 😁 I have a hunch you and I may be related. I made these last night, despite the minor trepidation that baking and pastry give me. They were excellent! Flavorful, fun to make, and so satisfying. They also reheat very well. Thanks to Ken and you, Tori, for providing such an excellent story and recipe! I am Jewish from Bulgaria, our Pastels was made in pie dish, not individual (less work) but never with uncooked rice we used whole grilled eggplant that was chopped in. This receipt brings back lots of wonderful memories. This is actually a message to Ken. I hail from Montgomery AL’s small Sephardic community all from Rhodes (and Turkey)- had an Aunt Matilda Alhadeff as well- we have family in Seattle- my guess is we are related! Just had pastellies for Rosh Hashona- my 91 year old mother still making everything delicious! L’Shana Tova ‘cousin’. Gilson, I believe we’ve met once many, many years ago. I always remembered your first name, for some reason. My grandfather David Mossafer came to Seattle while his first cousin stayed in Montgomery. Greg, I knew Ken’s grandmother. What a wonderful lady. She was my sister’s witness when she applied for citizenship. We would call her husband triple A. What a great couple. I’m also from Rhodes and I make good pastelles and yes, they are hard to make, but worth it. I have no way of reaching Ken and would like to know how Marian is. I hope she’s well. 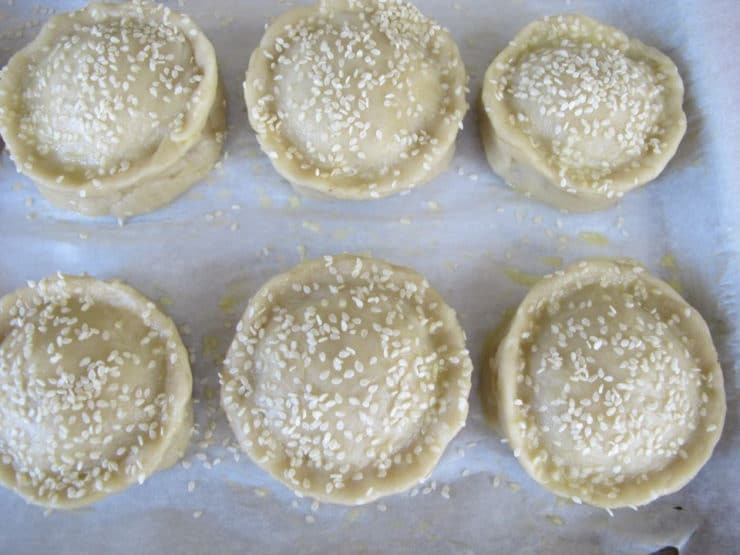 This is an amazing recipe for the most delicious meat pies that I have had in a long while! I second Adena’s question – do you have any sauce suggestions? As long as you’re not kosher, Tzatziki would be good!! My family just used ground beef, lots of onion , salt, pepper and beaten eggs. We eat this during passover and use matzah sheets which are moistened and wrapped in dish towels till flexible ( not too wet or you’ll end up with mush!) as crust… brush with oil, cut into serving squares before baking and bake at 350 till completely cooked and matzah begins to brown slightly! What would be a good dipping sauce to serve alongside this? What do you mean by “switch the sheets”? Take all the pastelles off & flip the parchment over? Take them off, and replace with a fresh sheet of parchment? Move the baking sheet in some way? These look delicious. Can they be frozen & reheated? Francine, it means switch the sheets between racks in the oven. Sometimes the top of the oven is warmer or cooler than the bottom; switching the sheets helps things to cook more evenly. I have never frozen these but I would think they will probably freeze well. Ken’s grandma was Auntie Mathilda to me. My grandparents were Joya and Ezra Menashe. When I was a little girl Auntie Mathilda and Uncle Albert would come to Portland to visit and sometimes I would go to Seattle with my grandparents get stay at Auntie Mathilda’s house. All the aunties and grandmas were fabulous cooks. I still make “pastelicos” as my grandma would call them…. lots of work but always delicious! Wonderful post. I am searching for Pastelles all over Internet from last three days but all of them are irrelevant. I am Jewish, my husband is Armenian & Italian. This recipe (and the recipes reminisced about by Ken) are incredibly reminiscent of the dishes my husbands late (Armenian) Grandma made. They are also in an Armenian cookbook that was passed down to us! It’s amazing to see so much of his culture in the cooking of someone who is of my culture!! This article was fantastic and I’m hooked!! Thank you, all, for sharing!!!! 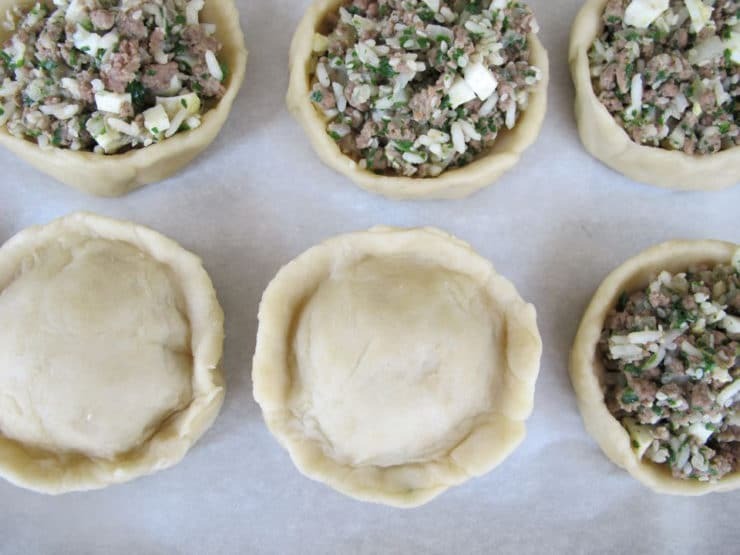 Savoury pies are the best and these sound really good! These sound and look wonderful. Any ideas on how to lower the fat in the dough? Fats are a huge no no for us but it leaves so many of these wonderful things behind. Yum, these look delicious…and so pretty! I just signed up and this was my first recipe. Imagine how surprised I was to see my Aunt Tilly featured. She was a wonderful lady and I have many special memories of her. This is one of my favorite recipes and I make them for my family. Claire, that is fantastic! Thanks for writing! What a wonderful and heartfelt post! 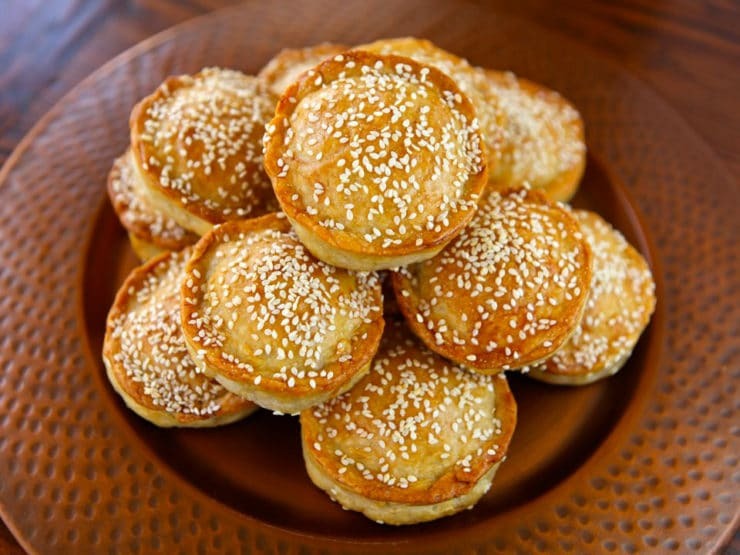 Similar types of stuffed pastries are typical in many Sephardic communities. In Venice we make them with either meat, or fish. Yum! I’d love to see some Venetian versions, Ale! No, thank YOU Tori for this wonderful tribute to a wonderful lady. She’d be proud! Ken, my grandmother, Selma Mizrahi, also came from Rhodes and made all the delicious things you describe …she was a wonderful cook. Her pastalleques as she called them were my favorites but I’ve been intimidated to try and make them…until now. Thanks! Making food that looks as good as this is surely a labour of love. Those little pies are beautiful! I really enjoyed reading this post. It was so interesting to read the personal history which accompanied this recipe. These pies are ALMOST too pretty too eat! What a great post, Tori. I am loving Greg’s book and those hand pies look so, so delicious! These little hand pies are too cute. I would love to try them with a bunch of different fillings. Thanks for sharing! This looks amazing and will be a nice addition to the chicken shawarma I’m cooking for Shabbat dinner. Will let you know how it turned out.